It’s supposed to be the happiest time of your life—and you want it to be—yet planning a wedding is like working a second job. You have to find the time to tend to a multitude of details as part of an already busy schedule while managing vendors, family anxieties and demands, your groom, your emotions and an array of tricky wedding dynamics. True, some brides are downright demanding but most are nice people, sucked into the vortex of wedding planning stress, and overwhelmed by the stress, pressure, and expectations of those around her. You are not alone in feeling you can’t win! No matter who you are or what age, everyone has something to say about your wedding. You may be showered with congratulations and gifts, but you are simultaneously bombarded with unsolicited advice, wedding horror stories you don’t want to hear, and negative vibes from well-meaning friends and relatives who are too lost in their own experience to realize they are imposing on you. People tend to see your wedding as a chance to fulfill their own needs and family dynamics erupt in every which direction because as the clan prepares to gather they begin to act out what it’s all about for them—not you! The issues are classic—mom wants it to be the wedding she never had, sister or best friend wishes it were her, your groom is afraid to stand up to his family. Or the experience may be fraught with more modern challenges such as questions about mixing faiths, opting for a non-religious wedding or planning an alternative kind of affair. Wedding Goddess Antidote: A Bride has to clarify the wedding she truly wants, tries to stay centered and set clear boundaries that no one can penetrate with words or attitudes. If all else fails, consider this: The reality is that weddings tend to be for other people, but marriage is for you two. Focus on what your marriage will mean to you. The process itself sets forth a period of growth and change that can be very confusing and nerve-wracking. Once you decide to marry you will begin the process of getting ready for marriage, and unresolved emotions about parents and family, past loves, and concerns about the person you have chosen will come to the surface to be explored. This doesn’t mean you shouldn’t marry, it just means inner work is called for along with all the outer preparations. There is so much focus on the external experience that a bride can become mired in details and demands and lose track of herself and the reason she is getting married in the first place. When she feels that planning the wedding of her dreams means going to battle—with parents, family, friends, groom, and almost anyone involved—she becomes hostile and reactive. What began as a joyful experience turns into a fight…a fight for having the perfect wedding. It is exhausting and can turn even sweet-tempered people can turn mean and cranky. Wedding Goddess Antidote: Remember that the true meaning of marriage is to bring two together in a sacred union—the party is meant to be a celebration, not something that will kill your spirit in the planning. When two people in love literally step up to commit themselves to one another in matrimony they have the opportunity to unite not just their hearts, lives, and families, but to unite their very beings. And it is not just the couple that benefits from the ceremony – anyone who witnesses a wedding can be empowered and inspired by the love in the room. Focus on the love and remember it is always your aim. It really doesn't, so lighten up!) Some brides believe that they must have a perfect wedding in order to have a perfect marriage and a perfect life. They give the wedding day too much power. They begin to treat the wedding itself as something to be worshipped and served. 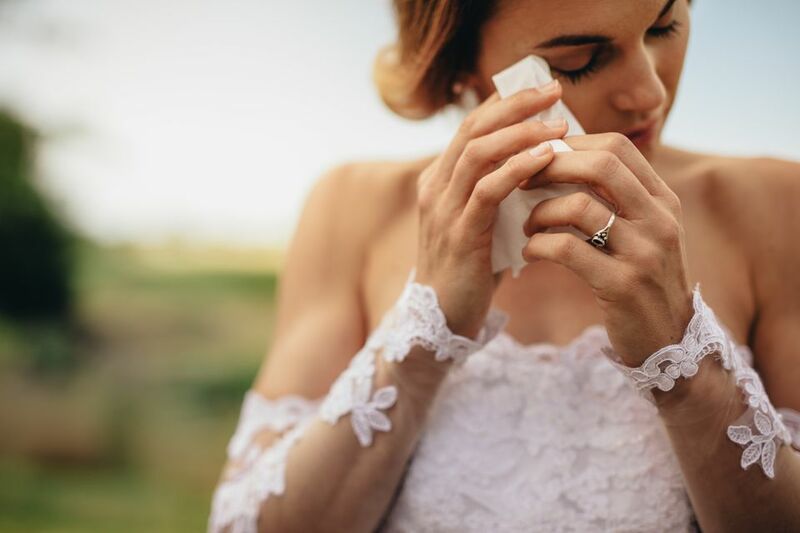 There is an underlying fear that if something goes wrong with the wedding, it is a sign that will make or break the marriage. Our culture places a tremendous emphasis on having a great wedding and not enough focus on having an awesome marriage. It's okay to be temporarily obsessed and to yearn for the perfect wedding—we all go there at some point—but you have to keep your eye on what's truly important. Rev. Laurie Sue Brockway is a non-denominational wedding officiant, who regularly marries couples in love. She is also widely recognized as a bridal stress expert devoted to helping brides-to-be tap into their inner power and poise. She is co-facilitator of The Bridal Survival Club and author of WEDDING GODDESS: A Divine Guide To Transforming Wedding Stress into Wedding Bliss (Perigee Books, May 2005). Visit her at www.WeddingGoddess.com.